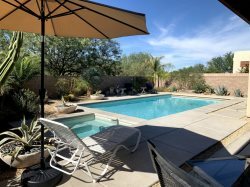 This beautiful community is nestled in the Santa Catalina Mountain foothills of Tucson and this particular location is a winter visitor`s paradise, featuring world-class hiking, championship golf, restaurants and shopping, all within a 1/4 mile or less. . This property is located in the Ventana Canyon neighborhood association & is a gated community. This ground floor unit is conveniently located in the middle of the Veranda at Ventana community, overlooking one of the two beautiful community pools. It is well within walking distance to fine dining, ( Italian, sushi, Mexican,Mediterranean, Peruvian) fast food, a large sports bar, grocery store and Pharmacy. This condo is locally owned and was completely renovated in 2011 to showcase a clean contemporary design. It has custom 18 inch ceramic tile throughout the main living areas with carpet in both bedrooms and walk in closets.